oo bad the only people who know how to run the country are busy driving cabs and cutting hair. View of our front yard from our roof. The trees are taking over. We grow and sell hardy trees for the Canadian Prairies. I’ve got 5 acres of grass, and don’t know what to do. Start here:Design but you have a lot to learn, and won’t do it in a single year. For this year think shelterbelts around the edges (see above). Conifers -- pines, spruces, firs, larches, cedars, junipers. Fruits -- Apples, plums, pears, cherries, and, for the adventurous, apricots. We also carry a variety of berry bushes: raspberry, blueberry, saskatoons, currants, gooseberries, buckthorn, nanny berries, high bush cranberries. Shelterbelts Willow, poplar, spruce and pine. Naturalization Thirty species native to at least parts of Alberta. Xeriscaping -- Low Maintenance Close to plant and forget. Tried and tested here on the prairies. 1 liter to 6 liter pots. Small, 16 inches to 4 feet tall. Affordable. Plant with a shovel. Miss with the mower. 15 liter to 40 liter pots. Midsize. 3 to 10 feet tall. Cheaper than most. 2 wheelbarrow hole, but if you’re doing a lot of them get a 2 foot auger. 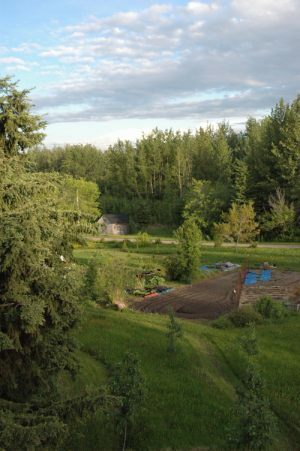 Acreage owners whose dreams and visions are larger than their budget, and need to start with young trees. Farmers who are getting tired of "The winds sure do blow cold a way out there"* and want to at least slow down the wind. Edible landscape fans who want to make their yards work for a living and put a dent in the grocery bill. Reclamation contractors who need trees that are larger than seedlings, but smaller than conventional garden centre trees. City dwellers looking for a special tree; either an unusual specimen tree or a privacy barrier. Municipalities So far we have sold to County of Leduc, St. Albert, City of Edmonton. Your town could be next. If you want to come for a visit, phone us first. Otherwise you may have ask the cat where I am. His command of English is poor, and he's got a thick accent. This is the Home section. The SFTF Advantage Why our trees are special. What We Sell An overview of the types and sizes of what we have. Prices An overview of typical prices. Not exact, but you can see if a project is possible. How To Buy How to order and buy from us. Warranty How we stand behind our product. Site Map A way to find anything if you remember that you saw it once, but can’t remember just where. Who we are, a (mercifully brief) story of our origin, how to contact us by almost any method but smoke signal and carrier pigeon, and how to get here. Start here. These are a bunch of common issues that come up. It will give you background, and help you come up with a plan. 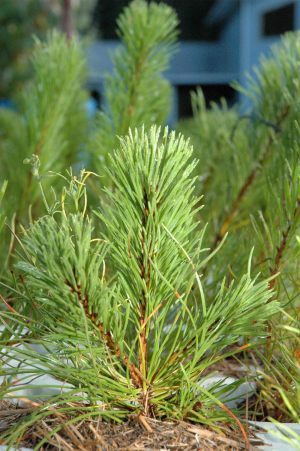 Descriptions and pictures of the trees we sell. What I know about the tree, its preferences for soil, light, and water, how fast it grows, shape. This maybe should be 'Pre-Ordering' or 'What's available this year' This is mostly for people who know what they want, and want to get their dibs in early. Tips on planting, watering, and so on. Pictures and text describing my forests, and how they change with the seasons and the years. On any other site this would be called 'blog'. What an ugly word! I prefer Almanac, which captures the flow of seasons. Notes about what I'm doing, and seeing on the farm. My way of sharing a bit of the beauty and magic of my world. Sites and places I've found useful. Some are quite technical, some are links to suppliers with stuff that's hard to find. Navigation here is a hierarchy, much like the folders on your computer. General stuff near the top level. Specific stuff a few layers deep. At any point, the menu items in white show you where you are in the directory. If you have questions, comments, suggestions, rants, or raves; if you want to be emailed with my current inventory when it becomes available; if you just want to know when major updates have happened, drop me a line. We regard the following communities as being part of our service area. If I missed your community name, please let me know. If you are outside our service area, we will still sell you trees, but delivery options are more limited.